House Stark has attracted a very diverse following up in Winterfell. Being so close to the edge of civilization, many from further north, including Wildings, have come to the warm halls and become allies of the Direwolf. Also, Lord Eddard has sired many children, each with their own distinct personalities. This means that House Stark has many different resources available to them which will surely come in handy out on the battlefield. This month, the Stark Heroes II box comes out for the A Song of Ice and Fire: Tabletop Miniatures Game. Let’s take a look at some of this new cast of characters and see what sort of advantages they bring to the table. Most of the figures in the Stark Heroes II box come in the form of Unit Attachments. Able to join where most-needed, they can take a standard unit and make them much more elite on the battlefield. For example, whenever Jojen Reed’s unit activates, his Greensight ability lets the Stark player roll a die and determine what sort of bonus they receive. It could be that the unit gets a free Maneuver action, or that they can re-roll misses that activation. But beware, rolling a 1 will cause the unit to become Panicked and Vulnerable. Seeing through someone else’s eyes can sometimes be disconcerting. Several of the Unit Attachments also punish the enemy simply for taking them on in combat. Osha causes Wounds directly to any enemy that dares destroy a rank of her unit. Meera Reed will cause the enemy to worry about every step they take, able to put out traps and cause Wounds to opponents simply for trying to move around the battlefield. Then there’s the master swordsmen Syrio Forel. His special rules are simple, as he causes the enemy to suffer -1 To Hit against his unit when they are attacked in melee, his fencing skills transferring to the troops around him. Aside from the Unit Attachments, there is also a single Non-Combat Unit in the box in the form of Arya Stark, The Wolf Girl. Having trained well under Master Forel, she has taken his lessons to heart and makes sure that the enemy never quite knows what she is up to. Her once-per-game ability allows the Stark player to give 1 free Maneuver action to a unit at the start of any round. This has many potential uses, from getting a jump on an enemy that thought they were safely out of range, to pouncing on an objective late in the game, or pulling a threatened unit out of harm’s way. As her flavor text says, “Never do what they expect” can be powerful words to live by on the battlefield. 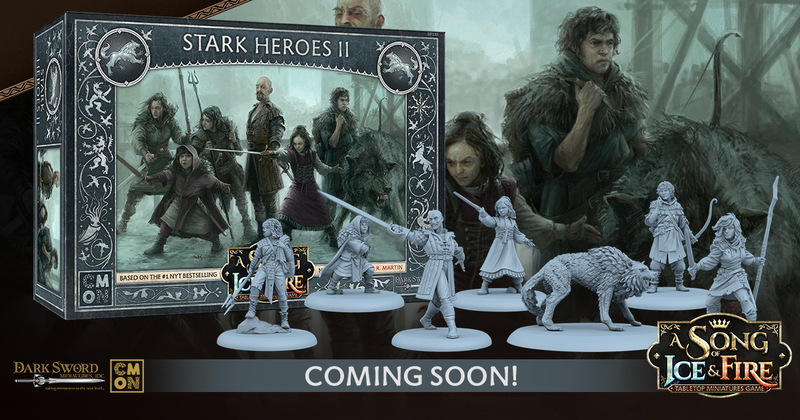 The Stark Heroes II box also contains a single unit. Shaggydog, Rickon Stark’s pet direwolf, is also included. A rather vicious beast (quite literally, as he has the Vicious special rule, which causes enemies to suffer -2 to Panic Tests he causes), and very fast on the battlefield, Shaggydog can tear into the enemy with is Savage Mauling attack, rolling two dice and hitting on 2+. However, to bring Shaggydog, Stark players must be cautious, as Rickon himself will also be out on the battlefield, and enemy commanders would surely love to get their hands on a prince of Winterfell. The Stark Heroes II box gives Stark commanders a myriad of new options out on the battlefield. Their units can become much more difficult to deal with and a lot less predictable with these various attachments and the NCU. And anytime you have direwolves roaming around, it’s a time to be cautious. This new box will be available March 29th. Read the full stats for these figures on the A Song of Ice and Fire: Tabletop Miniatures Game App on March 22nd. You can read more about the Stark Heroes II box here.